Georgia’s Non-Governmental Organisation (NGO) - the Institute for Development of Freedom of Information (IDFI)- has just released its latest study based on official data depicting the consequences of Russia’s creeping occupation of Georgian soil since the Russian-Georgian war of 2008. The NGO announced that the aim of the study was to specify the scheme Russia used when it was illegally advancing on the Georgian land. The IDFI concluded that the occupants used Soviet-era maps of administrative boundaries when erecting new banners and barbed-wire obstacles on Georgian territory. 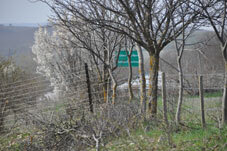 The IDFI also stated that based on the figures provided by Georgia’s Ministry of Defence, following the Russian-Georgian war Georgia, lost control of 135 residential points in the eastern Tskhinvali (South Ossetia) region and 16 such areas in the western Kodori Gorge. “Following the war, major parts of the Georgian population living in the Autonomous Republic of South Ossetia were driven out from their residential areas, the Akhalgori district and Mamisoni Pass among them. “Georgia lost control on 135 residential sites populated by both Georgian and Ossetian residents. The villages solely inhabited by Georgians had been totally destroyed in most cases and the people driven out,” the IDFI said. Touching on the topic, the IDFI said that after the end of the armed conflict in Tskhinvali in 1992, through the support of Russia, the Ossetian separatists exercised control over the greater part of the region, specifically the Tskhinvali district with its administrative centre, as well as the Java and Znauri districts. However, at that time the central Government of Georgia managed to maintain control over the Akhalgori district with the exception of five Ossetian villages, the Big Liakhvi district villages and almost all the villages of Sthe mall Liakhvi area, as well as six villages in the Znauri district, the Mamisoni Pass and some adjacent areas. Now the territories are being occupied by the Russians. The organisation has warned that based on the current situation, and the suspicion that Russia used Soviet-era maps marking administrative boundaries, the creeping occupation would continue, engulfing several more villages with Georgian populations. “Presumably, with the support of the Russians, the Ossetian separatists will proceed with their demarcation activities based on the topographic maps issued by the General Staff of the Soviet Union that reflects administrative boundaries based on the geopolitical circumstances of 1984,” the IDFI said. The NGO stated that the villages that will be under risk were: Zemo Nikozi, Ergneti, Ditsi, Mejvriskhevi, Plavismani, Tsitelubani, Karapila, Saribari, Tvaurebi and Avlevi. On the same note, the NGO has stated that the more populated parts of the Big and Small Khurvaleti villages have already appeared beyond barbed wires. 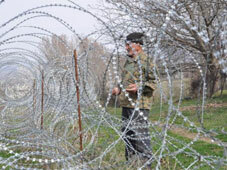 “Since erecting barbed-wire boundaries in 2013, the inhabited part of the Gugutiankari village has also come under the control of the occupants. Significant parts of the Zardiaantkari, Ghogheti, Dvani, Ditsi, Tsitsagiantkari, Jariasheni, Adzvi and Kveshi villages have also been grabbed,” the IDFI said. The organisation added that this year, Jariasheni has come under the full control of the occupant forces.